The project holder allows you to attach the Arduino® UNO and the included breadboard together. 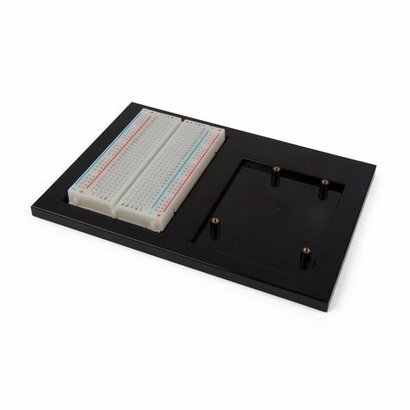 It contains two grooves (one groove size is 88 x 60 mm), which is the just right size to fit a 400 holes breadboard; the other groove is for the Arduino UNO. The position of 4 M3 screw holes fits the Arduino UNO mounting holes. The holder comes with 4 screws (M3 x 8).